As a city planner, you naturally want to make the most beautiful and crowd-pleasing city. But watch out! 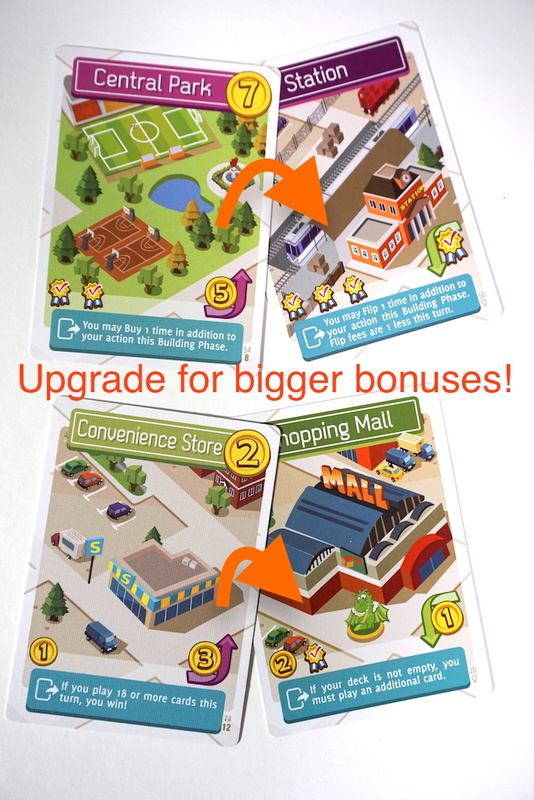 Other players may offload their problems to your beautiful city, even as you upgrade your buildings to become more useful. Will you flip for Flip City, or is it more of a flop? Flip City is a card game by Chih-Fan Chen and published in the United States by Tasty Minstrel Games. 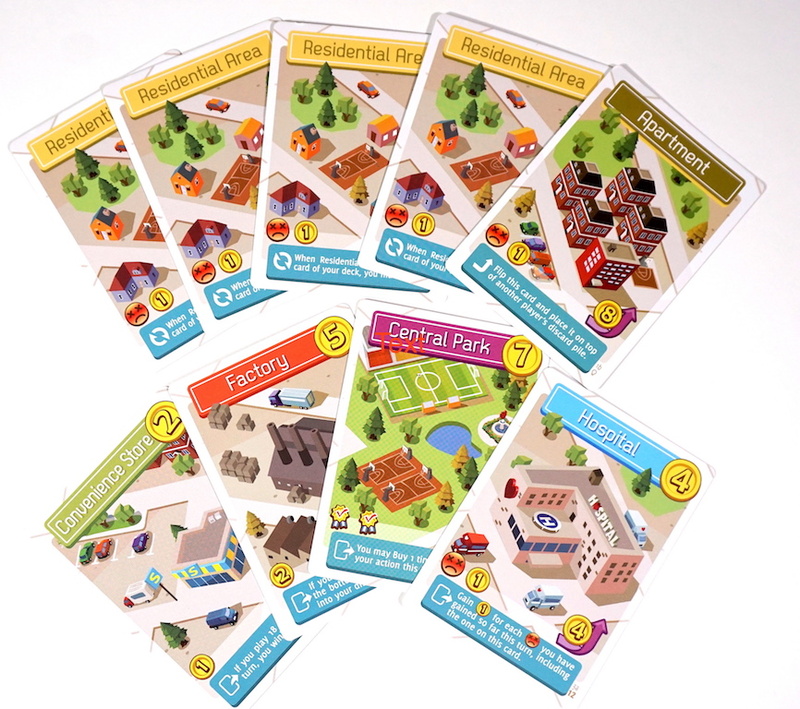 It combines deck building and press-your-luck to create a city building game with an interesting flip. 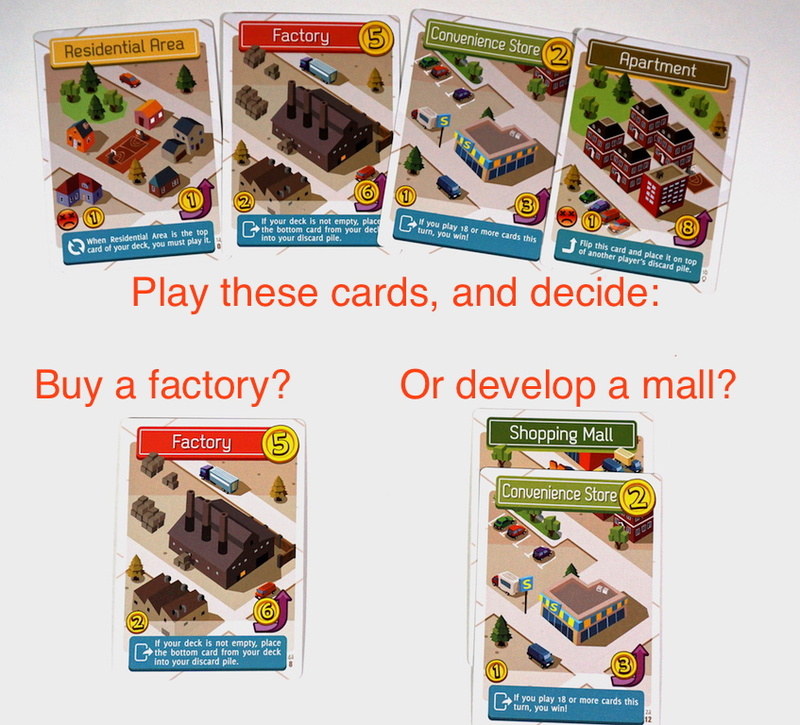 Each player starts with a deck of cards, representing your current resources to build a city. On your turn, play cards from the top of your deck one at a time. Buildings give combinations of coins, victory points, unhappy citizens, or powers. Keep playing cards until you either decide to build, or until you surpass the “unhappiness limit”. If your deck runs out, you may shuffle your discard pile into a new deck, and then decide again whether to keep playing or stop. Certain cards (Residential Area, Shopping Mall) require you to play another card, but otherwise you may choose to continue pressing your luck to accumulate more coins, or play it safe and stop. Unhappy faces appear on several cards, and normally (without bonuses) you may only have 2 in play on a single turn. As soon as you exceed this limit, your turn ends immediately. If you stopped before exceeding the limit, you are now in the Building Phase. You may now use the coins accumulated this turn to pay for one of three actions: buy a new card from the supply, upgrade a card currently in your discard pile (pay the cost and flip it), or buy a new card and pay to flip it immediately (called “developing”). After your turn ends, your current city moves to the discard pile. Victory points, coins, and unhappiness are not carried over to your next turn. At the end of each turn, check your city. A city that provides 8 victory points automatically wins, but certain cards allow for an alternative win condition. The Convenience Store specifies that if your city consists of at least 18 cards, you win! Tasty Minstrel is becoming known for games that have a small form factor and unusual play style. Flip City certainly fits this mold with its mash-up of a city-building theme with a deck-building mechanic. There’s also some pressing your luck (via the unhappiness limit), which keeps the game fresh. The two-sided cards make deck management a bit awkward. You need to shuffle without accidentally flipping a card and (preferably) without looking. You also need to avoid looking too closely at the deck while playing cards, in case you reveal more than just the top card. Flip City has very little player interaction. Each player simply takes their turn playing out their cards and adding to their deck. 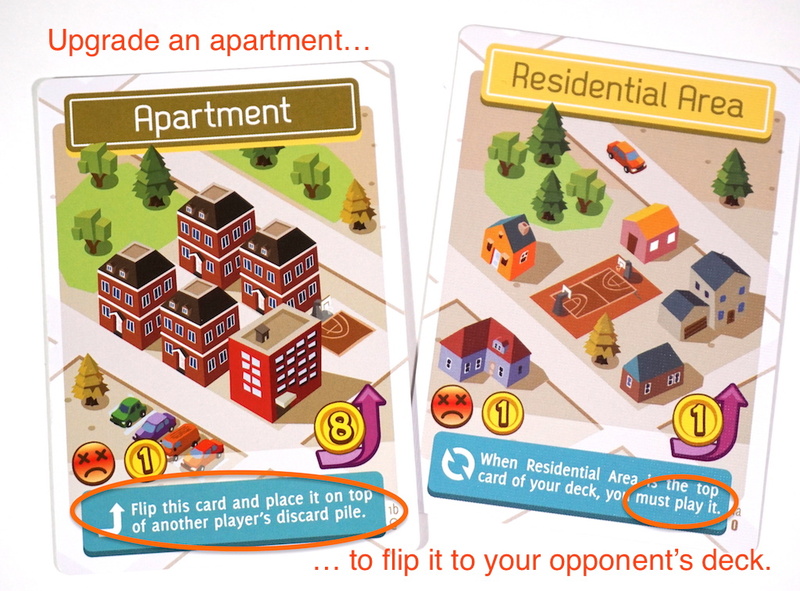 The Apartment card does allow you to mess with your opponents; upgrade it for 8 money to flip it back to the undesirable Residential Area and put it in another player’s discard pile. Solo mode gameplay is nearly identical to group play, which is both a strength and a weakness.The slow turn speed and lack of interaction means that we had more fun playing Flip City solo than with family. It’s a solid game, but always left us feeling like there was something missing. As a solitaire offering, however, I enjoy it and will keep playing. If you’re in the market for more solid solitaire options, or really enjoy deck building, then Flip City would be a good choice for you. In fact, if you love Dominion, you will like Flip City and would enjoy its new twist on deck-building. Its small size makes it incredibly portable. Find it on Amazon or at your friendly local game store. The Family Gamers received a promotional copy of Flip City from Tasty Minstrel Games. As a solo game, 7/10.